A man who has been in law enforcement for nearly 40 years is now getting help from the sheriff’s office he has served. 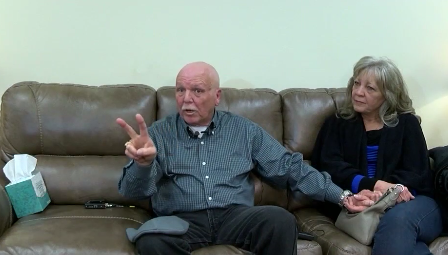 Corporal Dennis Miller, who just retired from the Tulsa County Sheriff’s Office after nine and a half years, is battling stage four breast cancer. “When they said you have breast cancer, it was like, ‘Really? Are you serious?” Miller said. The corporal was diagnosed in September. The unexpected news has shocked his family, but he said the disease among men is not as uncommon as some may believe. Since his diagnosis, Miller said his doctors have told him eight more men in Tulsa were also tested for breast cancer. Miller said he is recovering from a broken rib after first finding out his condition. He’s also dealing with several tumors along his spine and hips and other symptoms that have weakened his body due to the severity of stage four breast cancer. Despite losing his hair during chemotherapy, Miller somehow managed to keep a mustache. “It’s always been kind of a joke because I’ve always had a mustache since I was 14 years old,” Miller said. Now, the joke has encouraged others at the sheriff’s office to grow one. The office will be holding a benefit concert in Miller’s honor Dec. 17 at the Oklahoma Jazz Hall of Fame. Big names in Jazz music have offered to donate their talents in support of Miller, who also happens to favor the genre. The deputies will shave their mustaches during the event to show their support for Miller. Since his diagnosis, the corporal said a typical week for him consists of a doctor’s visit and chemotherapy on Wednesdays. He said he also gets three different medications every three weeks. “I’m just a fighter. It’s not going to get the better of me,” Miller said. The benefit concert will be held from 6-8 p.m. Dec. 17. Tickets can be purchased online for $20 or for $25 at the door. Proceeds will go to Miller’s treatments and recovery.